FILANTROPI INDONESIA FESTIVAL (FIFEST) or Indonesia Philanthropy Festival is a routine activity which conducted once in two years, and this year will be the second festival we conduct. The activity will not be only consisting of exhibition but also conference, networking session, skill share, talk show, Partnership forum, as well as field trip to various philanthropy project. 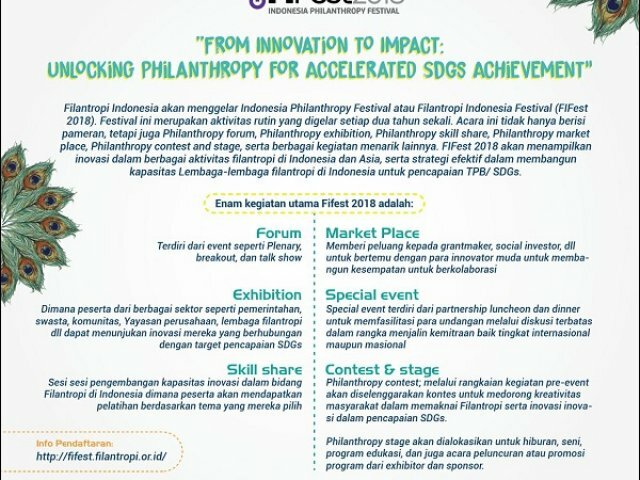 FIFEST 2018 will show innovation in various philanthropy activities in Indonesia and Asia, also, the effective strategy in building capacity of Philanthropy institutions in Indonesia for SDGs achievement.